Links | English, ESL -- and more! Use the comment facility to suggest links or note dead links. Thanks. All checked 18 September 2007. UPDATE 18 November 2008: Yes it has been a while. I just added a couple, and plan to check the page very soon. Meanwhile, do report any broken links or make suggestions. I have reopened comments to facilitate that. Comments are moderated so ones judged to be spam or mere commercial promotions will not appear. All sites checked and working 18 September 2007. English writer John Baker — this leads to an excellent group of entries on the craft of writing. MikeArnzen PhD: Pedablogue — “A Personal Inquiry into the Scholarship of Teaching.” Mike is on sabbatical so the blog is on hold until August 2007. Still a lot to read there though. MyScribbles: Write-ups of an Afghan — young aspiring Afghan journalism student in Pakistan. Rampantred’s Weblog also includes excellent pages on ESL and Literacy. Shakespeare Film Blog: Duncan and Ennis Macleod — A Queensland Uniting Church minister and his English teacher wife explore a number of Shakespeare’s plays and their transformation into film. Misrule: the home of Australian children’e books — site upgraded October 2007. Oz Lit Australian literature database — this site, sadly, seems to be decaying, not having been updated since 2000. Perry Middlemiss Australian Literature Site — has much useful information. The Visual Dictionary — “learn by way of image with thematic, clear and precise pages, with concise and rigorous texts.” In English or French. Intute Arts and Humanities — very comprehensive gateway site. The Fundamentals of Critical Reading and Effective Writing — a great site for Year 10 upwards. Voice of the Shuttle — very advanced. All sites checked and working 18 September 2007. These sites lead you to thousands of ideas, tutorials, quizzes and other resources! Real English is good for EFL and ESL. It uses video of authentic English from different parts of the world. The Valve: a literary organ — mainly for teachers or 3 and 4-unit HSC students. The Valve is a literary weblog dedicated to the proposition that the function of the little magazine can follow this form. We mean to foster debate and circulation of ideas in literary studies and contiguous academic areas. Since a narrow academic focus would be unlikely to serve this primary project, our focus is not narrowly academic, nor purely literary. Authors are free to wander so long as they do not make positive nuisances of themselves with respect to our general aims. The Voice of the Shuttle — very advanced. “VoS is woven by Alan Liu of the U. California, Santa Barbara, English Department with a team of department graduate students and others.” Amazing place. Literary Genres – What are they? Hardboiled Heaven — free Tripod site so downloads slowly because of scripts and ads. Genre : a Collection of Provocations and Koans by Matt Greenfield — “I don’t agree with all of the statements that follow, and they don’t all agree with each other. But I find them all “good to think with,” as the anthropologists say. Literary Genres & Modes — from The Victorian Web: a hub page for all the major genres used in that period. Major Literary Genres— BBC AS Guru site. The Evolution of Comedy As a Literary Genre by Michelle A. Broskovich. The curriculum unit I have developed by participating in The Pittsburgh Teacher’s Institute course “Comedy from Aristophanes to the Present” will examine the evolution of comedy as a literary genre. At the beginning of the course I knew nothing about comedy. Maybe that it was supposed to be funny. Ha-ha. My proposed research project will consist of three areas. The first segment of my unit will provide a unit lesson plan to bring the genre comedy into the classroom. Many schools teach tragedies, yet very few schools teach comedy. I knew nothing about comedy at the beginning of the course. I have broken down the research into manageable and presentable blocks of information for teachers and students to experience comedy. The second section will focus on the history of comedy. This section will provide detailed, background information on the origins and development of comedy through history. Secondly it will examine the literary elements of comedy. This portion will evaluate and explain the essential elements and ideas of comedy. The final segment will provide a unit lesson plan to bring the genre comedy into the classroom. Many schools teach tragedies, yet very few schools teach comedy. I knew nothing about comedy at the beginning of the course. I have broken down the research into manageable and presentable blocks of information for teachers and students to experience comedy. This list could prove endless! I have just included a few that have come up in my tuition. Links checked 18 September 2007. Just a taste! Links checked and updated 18 September 2007. Sam Femiano and Mark Nickerson: How do Media Images of Men Affect Our Lives? 15 Misconceptions About Multicultural Education: Jerry Aldridge and others. Color Blind: Teaching Tolerance — a new US site worth looking at. All sites checked and working 18 September 2007. Leads to thousands of quizzes! Fun Trivia: Do you know Englishes? All sites checked and working 18 September 2007. The choice does reflect my having worked most recently in a boys school. Books for Boys in Year 9 and 10–from Victoria. Learning To Read: Resources for Language Arts and Reading Research (USA) — “The purpose of this web page is to improve the quality of reading instruction through the study of the reading process and teaching techniques. It will serve as a clearinghouse for the dissemination of reading research through conferences, journals and other publications.” Links to developments in literacy, professional materials, research and critical issues. 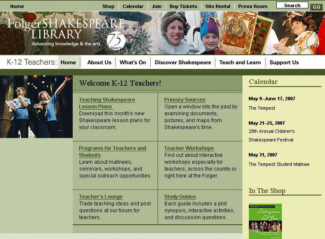 Folger Shakespeare Library for K-12 teachers — the lesson plans are good. Shakespeare’s Life and Times: Home Page — This site is supported by the University of Victoria and the Social Sciences and Humanities Research Council of Canada. Not the same as the page above. Shakespeare’s Sonnets — really beautiful site that has the sonnets, commentary, line-by-line explanation of harder ones, and great pictures and links. All sites checked and working 18 September 2007. See also tab above “Student Help”. So you have to do a Research Project? Where Does Time Go? Online questionnaire. Practise using the tools of writing — goes to a gateway; you’ll have to search there to find the relevant material. Writing with Writers — from Ashton Scholastic.